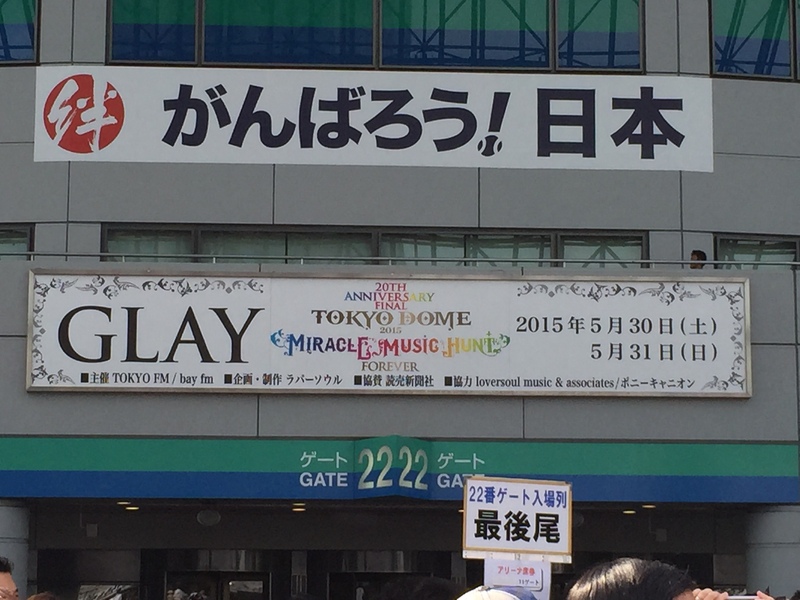 GLAY Miracle Music Hunt 20th Anniversary FINAL in Tokyo Dome 053015! 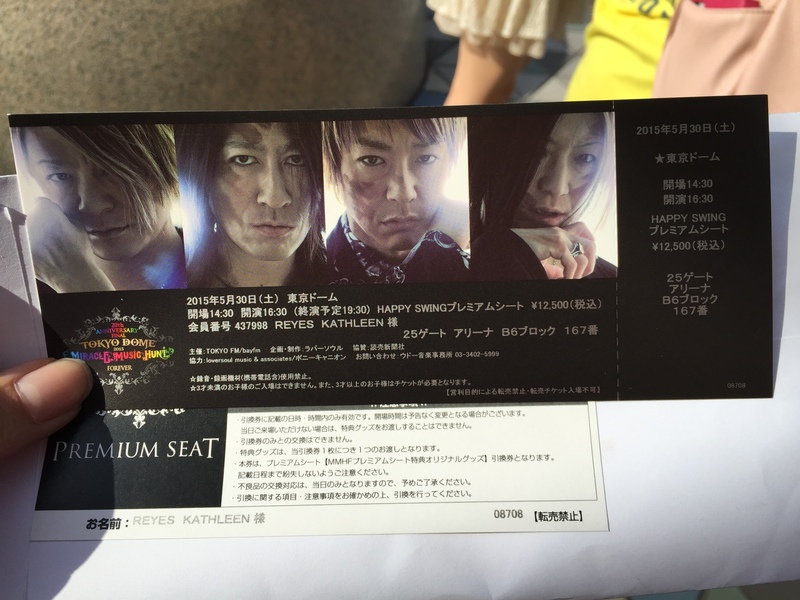 For the second time this year, I had the chance to see my favorite band GLAY perform live. It was still a part of the Miracle Music Hunt tour, but this was the final part and it was in Tokyo Dome! I attended Yokohama Arena concert last February, which you can read about here. They announced the Tokyo Dome concert then, and I made sure that I applied for better seats this time around. My ticket for this concert! I applied for a chance to purchase tickets through the fan club, and I was lucky I was able to get one for the Saturday (May 30) concert date. I applied for both days but I was only able to get one. I got the premium tickets (which were exclusive to fan club members) this time! Woo hoo! It was pricey at Y12,000 but it came with special tour goods, and the experience of seeing your favorite band up close! And this time, I’m not going alone. My friend Yuka was kind enough to take a day off from work to go with me. She said she used to be a big fan of GLAY (Jiro in particular) but haven’t been following their new songs for a while. She has never been to any concert before so she was excited to go to this one. By the main entrance of the dome. The fans waiting outside the dome. I arrived at Suidobashi station a few minutes before 3 pm. 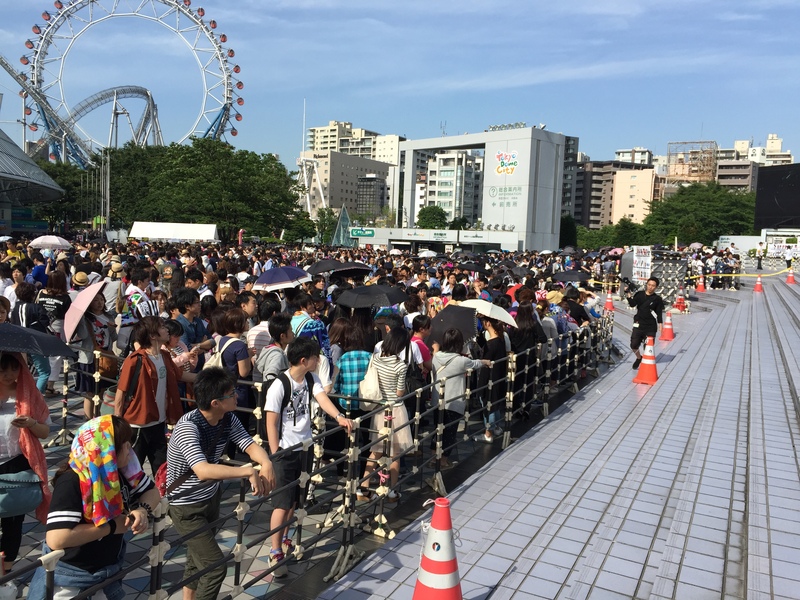 There were many people wearing the tour shirt hanging around the front of the ticket gates, and many were making their way towards the dome. I wanted to buy the photo book and a towel, and they had a selling area near the hotel. I decided to buy them there instead of heading towards the main selling area by the dome. They didn’t have all of the goods available there (they didn’t have the shirts or the game), but they had the ones I wanted and that was fine with me. That was a good decision on my part. By the time I got to the selling area, it was packed! It would have probably taken me at least 30 minutes (or even more) to make it to the front of the line. It was scorching hot that day too. 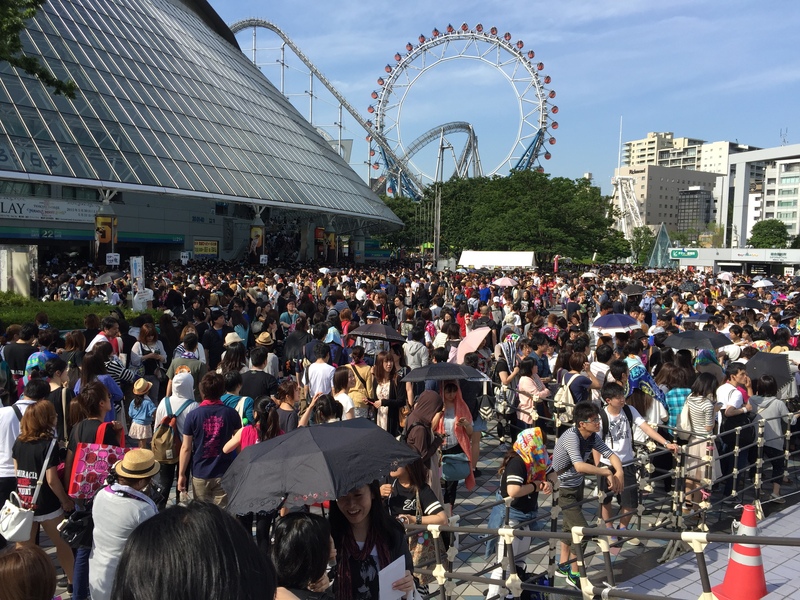 The line for the concert goods! I headed to Gate 25, the designated entrance for premium ticket holders. I waited for Yuka and we went inside. This time, I came prepared with a letter for the band! They had boxes for letters and gifts for each member or the band. I dropped off my card in the box and went to the counter for the special goods. They gave out a special towel and a gold version of the character doll that TERU designed. Yuka and I went and got ourselves settled on our seats. We were seated on the B block on the arena floor, which had a really good view of the stage. There was a special stage on our left where the band can walk around as well. 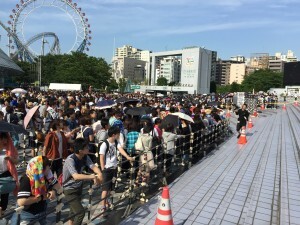 And like previous concerts, there were many ushers carrying signs that taking pictures or videos were prohibited, and once you are caught you will be sent out of the venue. The venue was full, and there were people seated all the way at the back of the stage! The prices of those seats are cheaper at Y6,000 but, they’re not the best seats. The concert started at 16:30 and the band promised a lot of surprises for this concert. For example, the band entered from the back of the arena, where they had some small hot air balloons waiting for them. Each member had one and they went on stage using them! It was really exciting to watch. One of my favorite parts of the show was Jiro and Hisashi’s “battle” on stage with Black Money. Watching their stage rivalry antics on the concert dvds were really entertaining, and seeing it live was a whole different experience. Yuka and I enjoyed that part of the concert a lot! What came after that was my favorite: they performed Yuuwaku! Yuuwaku was the very first GLAY song I’ve listened to and it was what made me one of their fans. I couldn’t keep my excitement and I ended up squealing when I heard Toshi’s start for the song. Hisashi’s guitar rift for this song was really exciting to watch live. The last song before the encore was BLEEZE, and the band went off the stage after that. Everyone started chanting for an encore, and they showed a clapping game on the big screen. It was fun, and the band came out. They invited a special guest (I couldn’t catch his name), whom I think was their previous keyboard player (but I need to check on this). They performed two songs together: Sakurabito and HOWEVER. For the May 31st concert (which I was able to watch on WOWOW live), they had YOSHIKI as their special guest and they performed RAIN together. They performed “微熱Ⓐgirlサマ”, which was included as the B-side track to their single “HEROES”. Hisashi composed and arranged that song, and I enjoyed that performance a lot. I’m happy that I was able to hear one of his songs performed live. The last song they performed was “MUSIC LIFE” and they showed a montage of their pictures starting from their live house days up until the present. It was nostalgic to see their visual days up until now. They had the lyrics of the song up on screen so it was easy to sing along to the whole song. This is perhaps one of the best concerts I’ve been to so far (if not the best). It ended at around 19:30 and we were out of the dome by 19:50. Yuka and I were hungry, and seeing the crowd in front of the station, we decided to eat at one of the restaurants nearby. We found a table at Wara-Wara and that is where we were when the earthquake happened. At first I thought I was just dizzy, but then I grabbed on to the table, and then felt the whole place shake. It lasted quite long too. I was tempted to just go home then, but the trains were stopped and we already ordered food so we just decided to stay there. The trains were already running (albeit very slowly with a lot of delays) by the time we were finished. 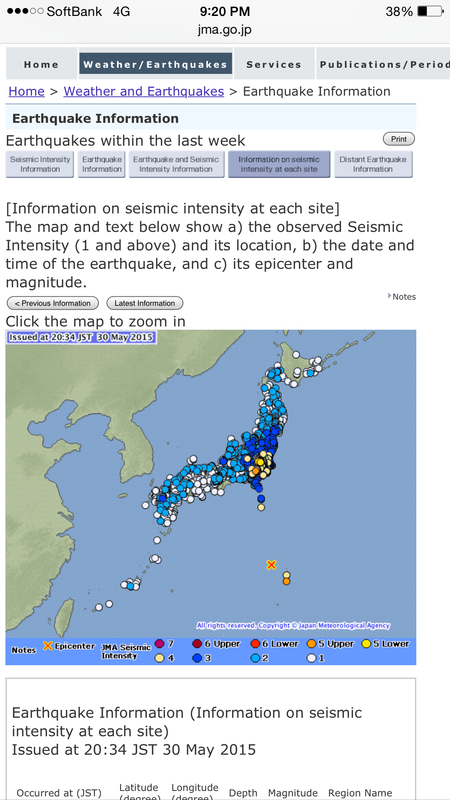 The information about the earthquake that struck after the concert. I hope I would get the chance to see the band LIVE once more. I still have a few songs on my list that I would really like to see live. They have another concert coming up in Hakodate, Hokkaido but I don’t think I can make it all the way there. 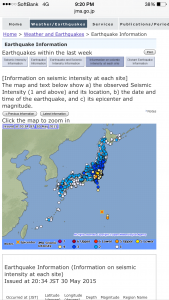 I’ll just wait for their next one in Tokyo (or nearer to Tokyo). hi,can i ask for overseas fans,how can we purchase glay concert tickets? Hmm, I am not sure how it is possible but maybe you can have deputy buyers do it for you? I’m fan from oversea too.. wondering how can I buy the ticket of their concert, dying to watch their concert. 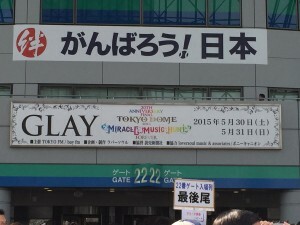 My first GLAY Concert in Japan! 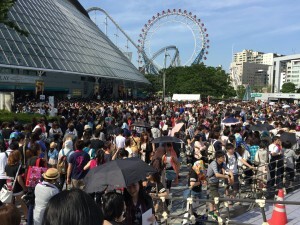 Miracle Music Hunt 2015 in Yokohama Arena! © 2013-2015 Snippets and Scribbles. All Rights Reserved.